When life gives you overripe bananas… Make some banana bread! Like many of you, I watch for the “bargain bags” of over-ripe and banged up bananas at the grocery store. We use quite a few of them in smoothies, and as bases for sorbet-like treats from the Vitamix, but inevitably I'll REALLY stock up on bananas and the kids will decide to stop eating them for a while. Thus enters the banana bread. I hadn't made banana bread in a while, as I have been eating fewer grains and reducing my gluten intake, and my favorite recipe used wheat flour. I was so frustrated when I checked out a stack of gluten free cookbooks from the library. Almost all of them were simply SAD (Standard American Diet) recipes, substituting gluten free flour mixes for regular wheat flour. Then I bought The Spunky Coconut Cookbook. I enjoyed Kelly's posts over at the Spunky Coconut, so I decided to invest in her cookbook. It's not a huge tome, and I saw a few gripes about the price on Amazon.com, but for me it is simply the best gluten free cookbook I have tried to date. The recipes have all been tasty, and the ingredients aren't too exotic for me to find locally. All the nuts are soaked before use, making them more digestible. I give it two thumbs up! 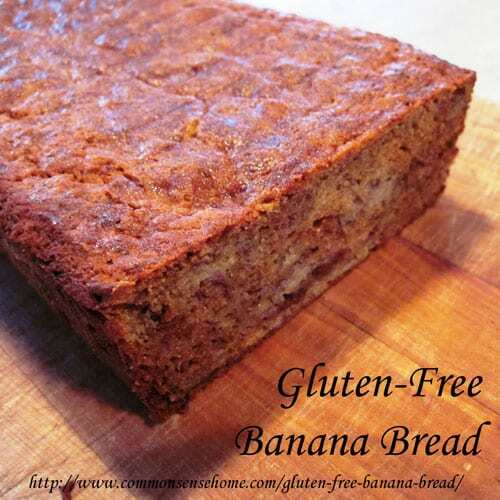 Here's Kelly's Gluten Free, Casein Free, refined Sugar Free Banana Bread. Mix together bananas, eggs, honey, coconut oil and liquid stevia. In a separate bowl, sift together dry ingredients except walnuts (you may also just mix them right in with the liquid ingredients, but I prefer to sift together and then mix – your choice). Mix all ingredients together, including walnuts. (I skipped the walnuts in this batch because my youngest is not a huge fan of nuts, just in case you are looking for them in the photo.) Pour into a greased 9″x5″ pan lined with parchment paper. This bread turned out nice and moist, with a texture that was very similar to non-GF banana bread (frankly, better than some non-GF breads I've had). Top with a nice pat of butter (or ghee, if you prefer), and I'm in banana bread heaven. My boys approved, too. The loaf lasted less than a day. I guess next time I make a double batch. just found your blog via GNOWFGLINS. i dream of homesteading… that lifestyle is fascinating to me. i'm glad i found you and i can't wait to read more! Welcome, Stacey. Thanks for taking time to leave a comment. The lifestyle is fascinating to me, too. No matter how much I learn, there's always more. 🙂 It's an adventure, to be sure. Big love from Scotland to you. This looks great, I will definitely try this one! I added a link to the product online. Vanilla Creme Liquid Stevia is a liquid sweetener made from stevia with added vanilla flavor. You could probably substitute vanilla extract and plain liquid stevia, or vanilla extract and more honey, but you might need to add more flour if you add more liquid (honey). I’ve still got a ton to learn about cooking/baking gluten free – it’s like learning a new language. I’ve also got a ton of wheat berries in storage. That said, I do plan to keep experimenting with GF and sharing what I learn as I go. Can I just use rice flour in place of the tapioca and coconut flour in the banana bread recipe? I’m sure you could, but I have no idea how the resulting bread would turn out. I have found adding some starch to these flourless recipes rly helps with the texture that we grainless ppl are missing so desperately. I did this with coconut flour pancakes and it helped alot. I also use coconut-flour-only, rarely. I use almond flour and coconut flour together. Coconut flour is so cheap compared to almond flour but the texture just doesn’t thrill me. If I could find a really really good pizza crust that is grainless I would kiss the person who discovered it. Breads from Anna Pizza Crust Mix, which makes two large pizzas, and it was quite good.